Click to Support Scorpion Biodiversity Research, all donations are tax deductible. 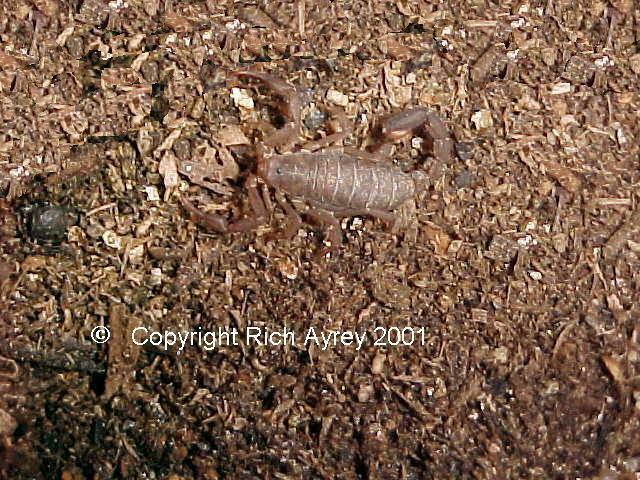 This tiny scorpion was found at 7000 feet in the Chiricauhua mountains of southeastern Arizona. Vaejovis cashi is a hard scorpion to get a photo of, due to it's small size, being less than a 1/2 inch in length. I found these scorpions 10 years before they were described by science as a new species. Unless otherwise noted, this photograph and all photographs by Rich Ayrey, do not reproduce without the written permission of the photographer. This Flagstaff Arizona Scorpion site copyright Rich Ayrey 2000-2017. Arizona Scorpion World last updated 01/14/2017.